Radio is a more affordable ad medium than say TV and it can still reach a large population. As with any advertising medium, if you actually want people to buy your widgets or book your widget-cleaners, you need to give people a good reason to do it. People won't flock to your shop, or jam the phone lines, just by hearing you're a "family firm" and offer "good service". Try to beat the "So what?" factor. The best way to do this is to come up with something unique about your business. The second best way is to come up with a unique offer. If you’re going to use a creative agency – find out their experience in radio. Print, TV and Web are very different forms of advertising. You want to speak to people who are experienced in getting results from radio. Some radio stations have their own creative departments. Because they specialise in radio, they are the best people to talk to about your creative, and making it work for you. Involve the creative team early. There are no charges for writing ads – just for the production when you’re ready to proceed. You can afford to spend time getting a script that will work for you, whether it’s 10, 20, 30, 40 or 50 seconds, and then plan the campaign around making that as effective as possible. Talk to the station or stations that best match your target audience, not just the one you listen you yourself. Radio targets audiences efficiently because different stations attract different listeners – Classic Rock listeners are worlds apart from Classic FM listeners etc. This allows advertisers to talk selectively to the groups they are most interested in. Added to this is radio’s regional/local structure, which means that brands can focus their activity very effectively onto key market areas. Most radio listeners are engaged in another activity, and this means that advertisers can reach listeners at key “touch points” – when they are on the school run, surfing the internet, before going out on Friday nights, and so on. And now that radio can be heard on mobiles, on the internet etc, these touch points are becoming even more widespread. Research shows that advertising which is relevant to a listener’s other activity is over 60% more likely to be recalled. Research shows that radio, together with cinema, has the lowest level of advertising avoidance – people rarely switch stations, and are available to listen to any message that is relevant, creative, intriguing etc. This is a great opportunity for advertisers who want to reach out to new customers, or to tell existing customers something they didn't know. Listeners use radio for emotional reasons – to keep their spirits up, to stop themselves from feeling bored in a car or isolated while doing daily chores. This leads to them seeing radio as a kind of friend, and this is a valuable context for an advertiser to appear in. It is even more powerful when advertising extends through into branded content – sponsorships & promotions. When a radio station presenter talks about “our friends at Company X”, the listener is hearing about a friend of a friend – this has a strong effect on bringing a brand closer. Radio commercials need to be played regularly before they begin to sink in with the listener. An ad that plays just a few times a week is not going to be as effective as one that plays a few times a day every day. There is a saying in the advertising world that “What you say x How you say it x How many times you say it” Generally speaking, radio's ability to target an audience and offer repetition makes it a very effective advertising medium. In fact, some of the most effective campaigns in business history have been "radio-only" ad campaigns. Commercial stations programme your ads according to their statistics on who is listening and when. Industry advice says you want to be sure that your target audience has the opportunity to hear your ad, a minimum of three times each week you’re on air. Plan to advertise for a minimum of four weeks, ideally longer. Remember that radio works on repetition over time. The fight for weekend retail business means that airtime is often more expensive towards the end of the week, but usually there are more listeners at the beginning of the week. Be smart about where you book your airtime. Overnight spots are usually cheaper, but unless you’re targeting insomniacs or shift workers, you may be better paying more for spots when people are awake and listening. Do not avoid drive times because you think people won’t be able to write down your number. You know that writing down your number is not the purpose of your advertising. The purpose of your advertising is to create the need to find your number. Select the station or mix of stations that best match your target audience and your budget. It might be better to have more listeners in your target market than more listeners in general. Just like with every ad you create, you must know your target audience. Most markets will have a number of stations from which to choose, most seeking to differentiate themselves by attracting different audiences. Advertising your western gear store on a country station makes sense. Advertising a teen clothing store on the same station doesn't. Make a list of the radio stations in your market. Listen to each one to help identify your own target audience. What kind of listeners will be tuning in and are they a potential customer for your product or service? Radio stations also offer programs you'll want to know more about before you buy. You won't want to advertise your Christian book store during a program that uses a raunchy sense of humour. In radio, audiences are typically broken down between male and female listeners by age. When considering which station to use, it's important to keep in mind whom you're trying to reach. Don't simply choose a station because it's the one you listen to. Choose the one your customers prefer. 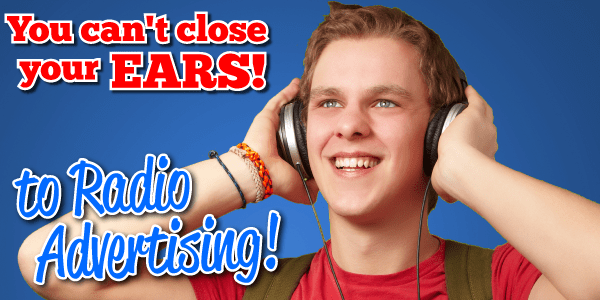 The first thing you’re going to want to know is whether you can afford radio advertising. A short rule of thumb is, If you can afford print advertising you should be talking to your local radio stations as well. The cost of both elements of your radio advertising – creative and airtime, is largely dictated by the number of listeners. Bigger stations cost more. There are two costs you'll incur when you advertise on the radio. The first is airtime--the time unit(s) your commercials are on air, typically broken down into 30-second, 60-second or 120-second segments (or spots), depending on the station. The other cost is the production cost, or the price for producing the commercial. Some stations will include production as an added-value option and incentive to advertise on their station. But be sure to consider your options before you commit to in-house production. Usually, the production teams at the station are fine as long as the voice-over talent and the producer have a track record of working successfully with small businesses. Most do, considering that small companies are the local stations' most reliable clients. If you decide to get your spots produced "outside," be aware that prices vary significantly between production houses and ad agencies. However, consider the return on investment. It may be worth a few hundred pounds to produce a top-notch spot that generates a response instead of an in-house spot package deal that does nothing. Finally--going back to airtime costs--radio is a medium that relies on repetition. You'll need to spend a certain amount before you begin to see any worthwhile results. You can expect to spend approximately £1,500 per week in a local market and at least £3,000 with a larger regional station. Spending any less on your campaign is a waste of money; you simply won't be able to get the repetition required to generate a result. The more ads you buy the better rates you'll be able to get as well as booking well in advance will secure good discounts. Good writers and producers make a huge difference to your campaign. Don’t be tempted to use an unproven writer or producer to get cheaper creative. Stations can and do refuse to broadcast audio that breaches the complex radio advertising rules or that is of too poor quality. Besides, this is the message you’re paying so much in airtime costs to be heard – make it the best it can be! As with print once a script is approved for production, changes will incur extra costs. However you can usually re-licence your ad for additional stations or a longer time for a proportion of the original fee. Each station has a limited number of minutes a day to sell for advertising. Unlike print advertising where you can add extra advertising pages, on radio when the available minutes are sold there are no more. If you book late, you might get a good price on “leftover” airtime as the station will want to sell it. But this practice can put your whole investment at risk if good (to you) airtime isn’t available. You might get lucky. Often you don’t. It’s generally best to plan in advance. A £2,500 campaign on a small station over four weeks will probably run with one piece of creative which might cost you £250. A £25,000 campaign over a year will likely need a few different advertisements. At this level of investment, a jingle or audio identifier would be useful so listeners start to recognise your ads as soon as they hear them. A £250,000 campaign over a year might be worth licensing a famous song for £25,000 so your brand really stands out. Just because it’s longer, doesn’t mean an advertisement will cost more to make. A single voice 20 second ad will cost the same to make as the same voice on a 30 second or 40 second advertisement. The airtime will cost more however. Airtime varies immensely depending on the station’s listener demographics. On a local station or a smallish AM station, you could possibly get a solid campaign for a few hundred pounds a week. Expect to be spending £1,500 a week on a larger local or a regional station. Radio is possibly one of the most cost-effective methods of advertising when you compare cost per thousand. Generally, radio stations charge you per thousand listeners at one time - and a good rough price for this is £2 per thousand people. So, if the breakfast show has 100,000 listeners at 7.30am, then buying a spot at 7.30am will cost you £200. The late night show's 10,000 listeners would only cost £20. And remember - it's better to get a sensible repetition on a smaller audience than a huge audience not remembering your ad at all. You might therefore think: "Hang on, this looks like a nightmare to work out". It's not, since any radio station worth their salt will work this all out to your budget - giving you an estimated repetition figure, called "OTH" (opportunities to hear). Because of RAJAR, every station can design an effective campaign for your target audience. Stations will typically put together a range of differently priced options for you to compare. If you’re a first time advertiser, be prepared to pay in advance. However, most stations will let you prepay on a month by month basis until you have an account with them. Don’t be afraid to ask for discounts on airtime as a first time customer. Once you get your commercials produced, you'll need to decide when you want them to go on the air. You can choose from two basic types of schedules. One is "run of station," or ROS. This means the station will decide when your commercials air as well as the specific time of the day that each commercial will be played. The second type is target placed, or "flights." This strategy gives you the opportunity to decide when each commercial is played and for how many weeks during the month. Skilled radio advertising people can help you develop effective "flights." Just know that scheduled spots are more expensive because costs are based on both inventory and the demand for particular times. For example: morning and evening drive times are more expensive than midnight or early in the morning. Some ROS placements are less expensive than scheduled placements; however, they are typically less effective. Your local station will have RAJAR survey figures to indicate the most popular listening times for your potential customers. The best way to target is to find out which are the highest quarter-hour listening shares for your target demographic. That way, you are paying for your commercials when the chances are good your target audience is actually listening. Again, rely on your station sales rep to tell you which times will suit you best. Unlike television commercials, production is more simple for a radio commercial. You need a script and voice talent. However, that doesn't mean you should just slap something together. Your copy isn't relying on any visuals so it's vital you capture the listener's attention from the start. The copy needs to be crystal clear and not muddied by trying to be cutesy in your pitch. Voice talent can be as simple to find as calling the radio station. Most stations have a complete list of voice talent in your area. You send the script, they voice it. Remember, frequency is the key so make sure your ad hits the mark and will get the consumer's attention the first time. Research shows it takes a few times before the consumer actually gets what your company is all about. It's vital your ad stands out and conveys your message repeatedly. Radio commercials vary in format, but one of the most common is a dialogue between consumers sharing information about the product you are trying to sell. This is effective because it creates the facade of word-of-mouth advertising, which is the one of the most effective versions, and because it can be entertaining as well as informative. Pick your format and draft an outline. To flesh out your outline, start by writing the main info you want to include, such as a brief description of the product, location of the business and contact information. Then brainstorm ideas for the dialogue. When writing dialogue, pick characters that appeal most to your audience. If your audience is middle-aged mothers, use two middle-aged mothers. If it's a teen audience, use teenagers. Keep the dialogue brief, with only necessary ingredients. Radio ads have to fit in a small time slot, usually only 30 to 60 seconds, so you don't want to waste time on meaningless repertoire. To articulate your point in the advertisement, repeat it. Open the ad with your selling point, repeat it somewhere in the middle and possibly even close with it, too. Insert the business name into the draft. Do this twice for a fifteen second commercial, three times for thirty second commercials and at least four times for a sixty second commercial. The last thing in the advertisement needs to be where a consumer can locate your product. If a listener turns on the radio in the last five seconds of the ad, you want them to know what the ad is about. The very last sentence should include all essential elements. For example: "For a fast and friendly car wash, go to Jones' Clean Cars on 346 Main St.."
Know your audience. Ask your client what sort of customer they want to target. A commercial selling yachts will definitely be different than a commercial promoting specials at the local sports bar. Formulate your idea. Bounce some creative ideas off other writers or with the client. The commercial will be short, so pick one idea and stick to it. Let the script sit for awhile, take a break, and then return to it with fresh eyes. Edit it as necessary, but remember to time it again once you are done. Present the script to your editor or client for final approval. Studies show creativity can make up to 500% difference in radio advertising. Be clear about what you want your advertising to achieve. If it’s brand awareness you’re after, work with credible creative experts who know what they’re doing and be prepared for it to take time. If you want to shift product, make sure your offer is a strong one. Radio is a conversational medium. Presenters don’t shout – neither should advertising. Present one clear message. An ad with three offers, a website, an address and a phone number is confusing. One well-delivered offer with a sensible call to action will produce results. Sound effects are another important consideration. Radio is limited only by the imagination. At no cost to them, listeners can be transported anywhere! Just make sure it’s relevant to your product or service. Sound effects can help create a mental picture for your clients. For example, the clutter of dishes in a kitchen setting or the sound of a lawn mower in the background while two neighbours talk can create an effective mental picture for what you are selling. Your local station will have a number of different effects from which to choose. You may even decide to have your commercials recorded "live" in store--especially if you have a large retail location. This allows you to create the impression of your business being a popular, vibrant place. A phone number takes on average three to four seconds to say. That’s seconds where you could be selling your product or service (eight seconds if you have to say it twice). And there’s not a number in the world that’s enjoyable to the listener. Realise people listen to the radio while doing other activities, so don’t expect listeners to write down your details. Trust that when they’re motivated, they’ll look you up (Thomson’s, Yellow Pages, Internet, Telephone Directories, calling the radio station). If you want your commercial to stand out from the rest, you need to consider some additional factors regarding voice-overs and sound effects. You may be tempted to voice the commercial, but think again--unless you have a really good voice for radio. Specialist and celebrity voices can work brilliantly but they cost more. Ask yourself if they genuinely benefit your brand. To find a good voice-over talent, keep in mind whom you're trying to reach, and choose someone with a voice that's believable and that relates to your target. Research shows getting the music wrong is worse than having no music at all! Remember that commercial music is copyrighted (e.g. your favourite Madonna track) and can be expensive to license, but there are many effective alternatives. Also know that popular music is subject to royalties and usage fees, so if you are looking for your favourite song from last year to back your ad, be prepared to pay for it--and it may not be available for commercial purposes. You'll also need to give some thought to the type of music you will use. Music is optional, but if you decide to use it in your commercial, keep in mind that it must suit the mood you're trying to create. While music can help attract your prospects' attention, it should not distract them from your selling message. The economy of words. As a general rule, 65 to 85 words is the limit for a 30-second commercial. However, be aware that this can vary depending on how many sound effects you use. Also keep in mind that your copy block for a 60-second spot will generally only be 30 to 45 seconds, as you will want at least 10 to 15 seconds at the end to include a call to action, phone number or web address. Also remember that radio is a "background" medium. Most people listen to the radio while doing something else, such as driving or working in the garden, so it's important not to put too much information into your ads. You should focus on a single theme, or the "big idea" you want to get across. The general rule is "one topic, one ad." Just be aware of your target and your message--and be sure to measure your results. Once you find the right combination of audience, message and results, there's nothing in your way to stop you from creating a long-term and very successful radio campaign.